Native American Indians were a deeply spiritual people and they communicated their history, thoughts, ideas and dreams from generation to generation through symbols. There is no common symbol Sisters symbol. It might, however be depicted similar to the mother symbol. 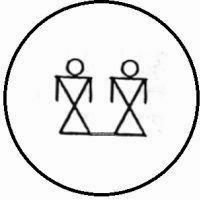 The sisters symbol is therefore depicted as two women surrounded by a circle. A circle around other Native American symbols signifies family ties, closeness & protection. The circle has no break and holds that which cannot be broken. The circle is used as a basis for many symbols including the cycle of life from birth to death to rebirth and is suitable as a symbol for sisters. For additional information refer to the Family Symbol. The symbol of the sisters depict two women who are positioned side-by-side which represents unity and equality. The line connecting the women symbols indicates that they are sisters who are bond together and represents a shared journey through life. The Symbol for Brothers are represented by a similar sign. Should one woman symbol be positioned above the other this may be interpreted as a Symbol for Mother with a daughter and son or as a symbol of a grandmother. with his wife's sister, marrying her as well."